Refusing to acknowledge that Tetris and Jenga are both incredibly challenging in their own rights, ThinkGeek has mashed the two of them up into a new game that has you stacking 3D tetromino-like pieces on a game board that actually hovers. Not even that crazy multi-level chess game in Star Trek seems this futuristic. 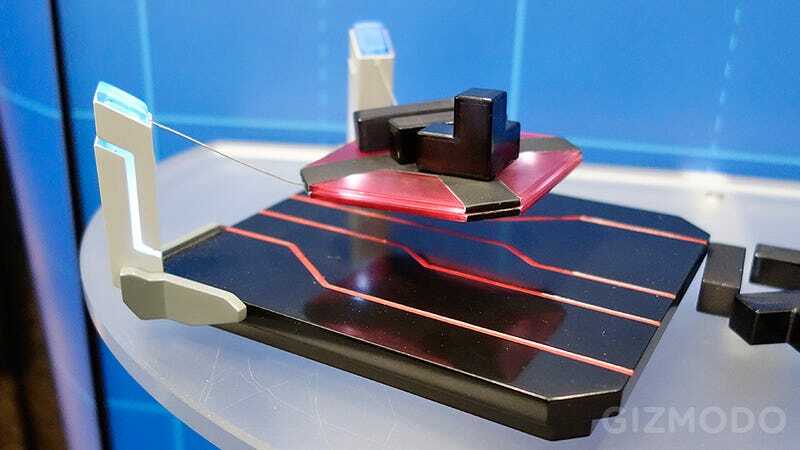 The Hoverkraft Levitating Construction Challenge won't be available until later in the year, but it already seems like the perfect game to tear your family apart during the holidays. Thanks to the awesomeness that is magnets, the support structure for your tower floats perilously above the game's base. So not only does every single piece have to be perfectly balanced, the whole tower does too lest it come crashing down.